Mother, the film, breaks a 40-year taboo by bringing to light an issue that silently fuels our most pressing environmental, humanitarian and social crises - population growth. Population was once at the top of the international agenda, dominating the first Earth Day and the subject of best-selling books like “The Population Bomb”. Since the 1960s the world population has nearly doubled, adding more than 3 billion people. At the same time, talking about population has become politically incorrect because of the sensitivity of the issues surrounding the topic–religion, economics, family planning and gender inequality. Yet it is an issue we cannot afford to ignore. 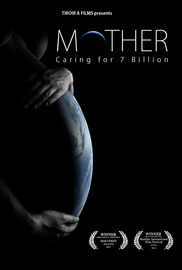 The film illustrates both the over-consumption and the inequity side of the population issue by following Beth, a mother and a child-rights activist as she comes to discover, along with the audience, the thorny complexities of the population issue. Beth – who comes from a large American family of 12 and has adopted an African-born daughter–travels to Ethiopia where she meets Zinet, the oldest daughter of a desperately poor family of 12. The film strives not to blame but to highlight a different path for humanity.